This manicure was inspired by a comment in one of my recent posts. 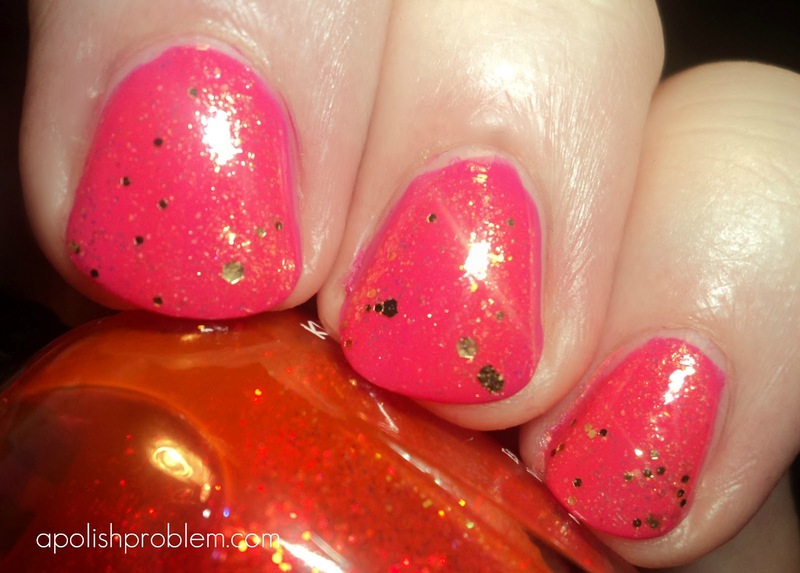 Diana suggested topping a hot pink with gold glitter. I thought that was a perfect idea, though, just like all my ideas of late, it didn't work out exactly as planned. I applied a version of this manicure last night using Illamasqua Collide and Lippmann Boom Boom Pow. Unfortunately, my bad luck with Collide continues and I could not get it to set. It was still wet when I was ready to go to sleep, so rather than deal with sheet marks, I removed it. Today, I wanted to reapply the look, but I was still wary of Collide. I tried to find another hot pink, Julep Samantha, but it seems to be missing at the moment, so I went with Zoya Lolly, from their 2011 Mod Matte collection. But the base color alone didn't quite work for me (it's not as neon as Collide), so I added 2 thin coats of Klean Color Chunky Candy Holo (bottle pic). Chunky Candy Holo is such a unique glitter top coat. It is small mutli-chrome glitter that shift from pink to orange to gold in a bright pink sheer base. I then added a coat of my favorite glitter top coat, Lippmann Boom Boom Pow and topped the whole thing with Nubar Diamont. Zoya Lolly is available from Zoya.com (and currently they have a B3G3 promotion with code SPRING3). This is a beautiful combo!! this combo came out looking great!